The Lovers (VI) has dual meanings. As its name implies, the sixth card in the Major Arcana is a sign of a strong relationship, but it can also indicate that you are at a major crossroads in life and that you should avoid making hasty decisions. 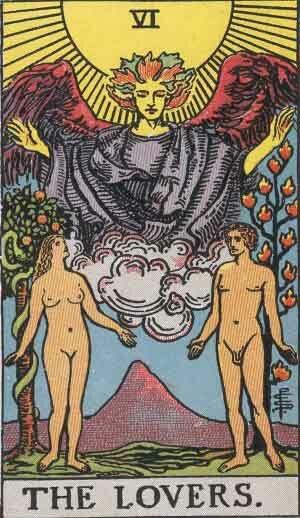 The Lovers card features a naked man and woman standing across from each other. The woman appears under an apple tree with a snake, evoking the Garden of Eden. The man stands before a tree with twelve trefoil flames, which represent the twelve signs of the zodiac and the fiery passion that shapes his destiny. Above the figures is the angel of air, Raphael, who looks down upon the pair as he blesses them. The element of air is associated with communication, a pillar of healthy relationships. In the background we see a mountain — a phallic symbol — and a river, which represents femininity. The Lovers card depicts the union of two opposing forces, as well as the fleeting bliss of a moment before it is corrupted. If you draw this card it is a sign that you are at a major crossroads: the decisions you are soon to make may alter the course of your existence. The Lovers can also indicate that you are someone who makes decisions from the heart. This card represents a passionate and sensual person who is prone to rash decisions and easily succumbs to temptation. One of the most positive cards, the Lovers represents unity, passion, and opportunity. Your relationships are strong — the time is right to make a difficult choice or announcement. The Lovers symbolize harmony, attraction, and perfection in a relationship. You and your partner are soulmates. Your relationship is based on deep love and trust, giving you the strength to overcome obstacles together and empower one another. The Lovers may also mean that a sexual relationship will grow into something more, as there is a foundation of mutual attraction. This passion has the potential to develop into true intimacy, as long as you acknowledge the importance of open communication. An important career decision often manifests itself at the Lovers card. Since it is part of the Major Arcana, your choice should not be made lightly, as it will have far reaching consequences. Follow your heart and your passion. This will lead to happiness and success in the long run. Many times, the right choice is the one that at first seems more difficult. The Lovers can also be a sign that a business partnership will be a fruitful one, and that you and your partner are in it for the long haul. The Lovers symbolize mutual attraction — not only between people, but also between you and money. If you have been short on money lately, assistance is on its way, but only if you ask for help and communicate your problems to someone else. Now is also a good time to take a financial risk such as starting your own business, asking for a loan, or going back to school. Your heart will be gaining strength soon. This could apply to your physical heart, or be a sign that your emotional heart will recover from the grief of a death or breakup. A reversed Lovers card symbolizes emotional instability or disharmony within a relationship. You may be lying to yourself or there may be a breach of trust within your relationship. The Lovers reversed is a major warning sign for a relationship. Communication between you and your partner is breaking down, which may lead to problems such as fighting, bickering, or even infidelity. The balance of your relationship is also lopsided, with one person taking more than they give, or one person feeling more committed than the other. You and your partner may also feel that there is a gap between your values that is difficult to surmount. Don’t despair — all is not lost in a relationship if you draw a reversed Lovers card. Balance and harmony can be restored if you overcome your communication challenges. 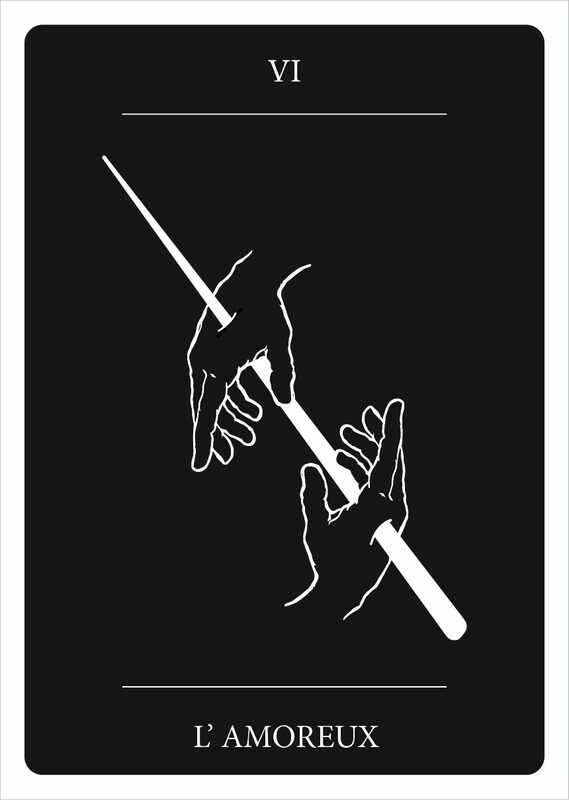 The Lovers card is associated with making important decisions. When it is reversed, it can indicate that you will be tempted by unethical choices and opportunities. You may be encouraged to risk something for the sake of your career. Think carefully before making any big decisions. When reversed, the Lovers card means that your finances are out of control. You may be paying too much attention to your romantic life and ignoring budgetary constraints. Reassess your personal finances before the problem becomes too big to overcome. You have difficulty healing from a physical or emotional trauma. Get lots of rest to give your body time to recover. Being kind to yourself and thinking positively will speed up the healing process and allow you to feel whole again. Finding the Lovers in the past position indicates that a romantic relationship is the foundation of your identity. If you have been with the same person for a long time, it represents the stability of your relationship. If you are in a newer relationship, it may indicate that your feelings for a former love are still governing your choices. In the present position, the Lovers card means that a relationship is developing and will bring passion and happiness. It can also indicate that a period of loneliness is about to come to an end, possibly with a new love or with personal growth and acceptance. In either case, the situation will be a transformative one. In the future position it indicates that the time is right to seek out love, while maintaining a clear understanding of your expectations. Don’t settle for less, and don’t be afraid to go for what you want. If you are in a relationship, communicate your needs to your partner. This card is a sign that their response will be positive. In general, the Lovers card represents unity. Depending on which card it is paired with, this unity could be short-lived or everlasting. These two cards are symbiotic. They both feature two people on each side, and are numbers 6 and 16 in the Major Arcana, making this combination especially significant. Where the Lovers card represents unity, the Tower shows two people being cast away. These cards together signify that a breakup or separation is on its way and that you are at the mercy of fate. The Ten of Cups represents emotional fulfillment, joy, and family. When combined with the Lovers, it means that marriage or commitment is forthcoming. This relationship will have the passion and harmony of the Lovers, strengthened by the deep bonds of marriage and family that the Ten of Cups represents. Like the Lovers, the Devil card features two naked figures, but the angel is replaced with a devil and the light replaced with darkness. These cards are mirrors of each other and represent a major upcoming transformation. This combination can also indicate that you are caught in the throes of a passionate yet destructive relationship. The Sun is a sign that you are headed in the right direction and everything is going according to plan. Combined, the Sun and the Lovers mean that a new relationship will bring great joy into your life. It can also signify that a current relationship will begin a happy and fulfilling chapter. The Lovers card is a yes, especially regarding decisions or matters of the heart. It urges you to move forward with your life.